Electrical Ratings: 15 A @ 125/250/480 VAC, 1/8 HP @ 125 VAC, ¼ HP @ 250 VAC, ½ A @ 125 VDC resisitive, ¼ A @ 250 A resistive. Hermetically sealed contacts: Rated 5 A @ 125/250 VAC 5 A resistive @ 30 VDC. Aluminum pressure port* ¼" NPT(F) process connection Buna-N diaphragm and O-ring Model No. 316 SS pressure port ½" NPT(F) process connection fluorocarbon diaphragm and O-ring Model No. *Brass pressure port available for water service. Note: The fifth and sizth characters designate the range of adjustment. HS - Hermetically sealed snap switch. HG - Hermetically sealed snap switch - gold contacts. 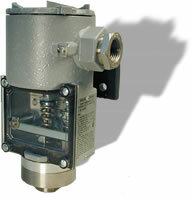 Pressure switches shall be (UL/CSA) (CENELEC) listed and be diaphragm operated with fully adjustable setpoint. Switch shall have visible setpoint indicator and adjustable deadband protected by clear polycarbonate window. Electrical terminals shall be isolated from setpoint adjustment. Housing shall be weatherproof and explosion-proof, Class I, Groups B, C, & D; Class II, Groups E, F, & G, CENELEC EExd IIC T6 (T amb. = 75°C). Switches shall be Mercoid Model SA11( _ _)E-(_ _)-(_ _)-(_ _).